Odds are, you’ll be driving up from the south part of the island. 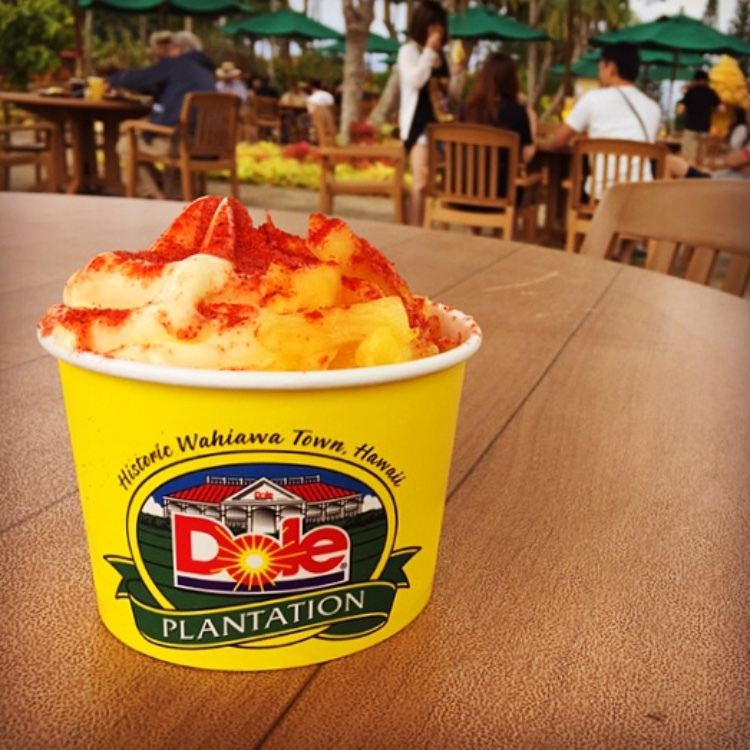 So you’re first stop will be on the way up to the North Shore: the Dole Plantation. Stop and get some breakfast. A Dole whip with li hing mui powder for breakfast is completely acceptable – and that knocks off two of the items on my Hawaii food bucket list. As I mentioned in a previous post, skydiving in Hawaii should definitely be on your bucket list. Because Hawaii is at sea level, you can fall 15,000 feet – the highest altitude you can go without an oxygen mask. If the land is at a higher altitude – say 5,000 feet – you can still only start your fall from 15,000 feet, so the drop is 10,000 feet instead. So Hawaii is definitely the place to skydive, and Pacific Skydiving is the most reasonably priced company. There are quite a few stand up paddle boarding rental places at Haleiwa Beach Park – for quite a good price, I might add. 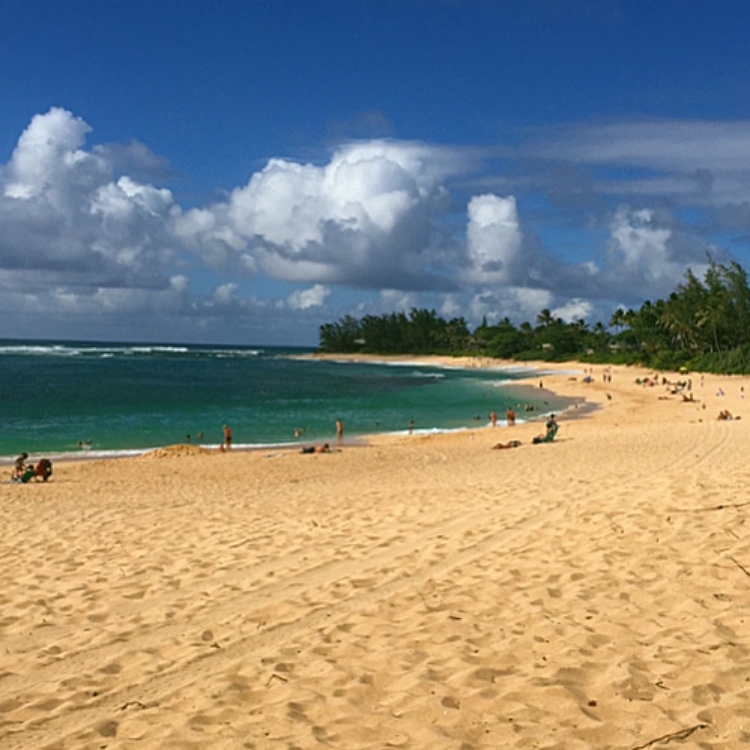 Plus, Haleiwa Beach Park is slightly enclosed, so you won’t have to worry about being pulled by a super strong current. Don’t get me wrong, there is still a current, but even a beginner like me can stand-up-paddle my way out. 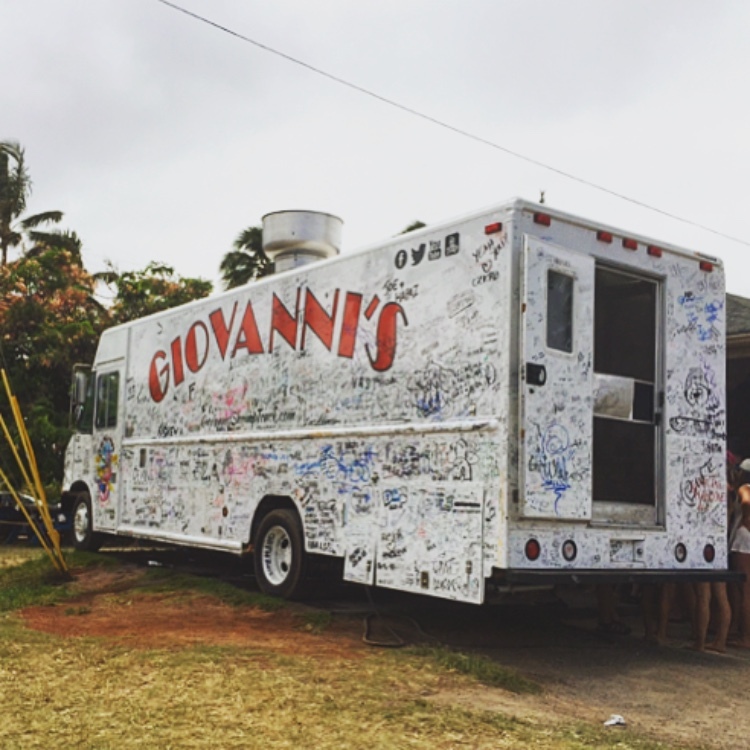 You’ll have to back track just a tad to get to Giovanni’s Shrimp Truck in Haleiwa, but it’ll be worth it. Always go for the garlic shrimp. Not the spicy shrimp. For those of you who are going to walk up to the shrimp truck and order the extra spicy shrimp anyway, don’t say I didn’t warn you. I have never met a single person who could tolerate the spicy shrimp. But the garlic shrimp is delicious. 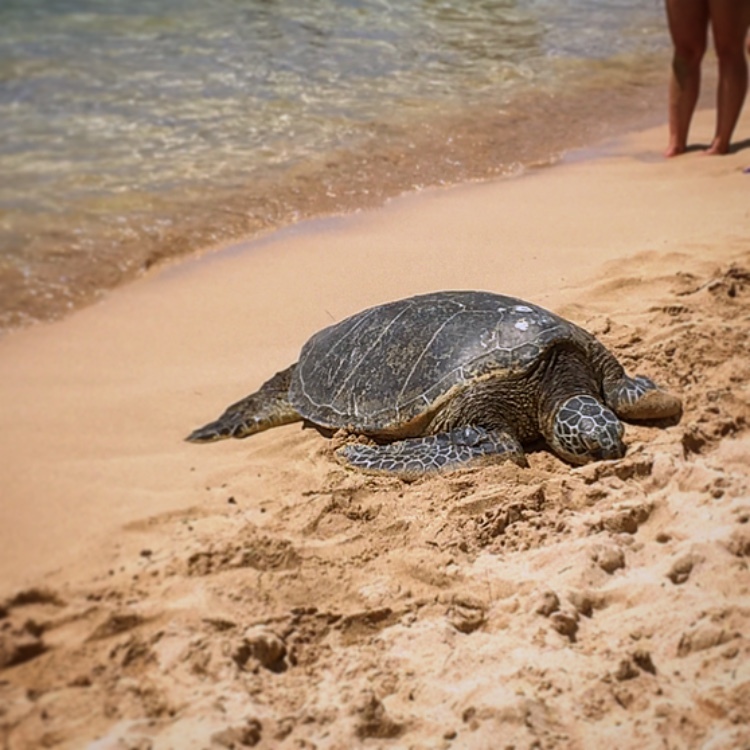 Laniakea Beach, also known as Turtle Beach, nearly always has turtles (locally known as “honu” – check out some more local words you need to know here) just lying around on the beach. Of course, be sure to keep your distance, as Hawaiian sea turtles are a threatened species. This one will be a very quick stop. As a matter of fact, your driver will probably have to sit in the car, because there will be no parking (so choose someone who is afraid of heights or deep water to be the driver for this portion of the journey). Basically, all you need to do at Waimea Bay is run out of the car – you don’t want to keep your driver waiting for too long – climb the tall rock on the left side of the beach, and jump into the bay. Now you’ve gone cliff jumping too. By now, I’d already want a snack, so Foodland would be the place to go. This local grocery store chain has all of the local snacks from wasabi peas to arare to POG to li hing mui seeds. Basically just walk through the aisles and buy the things that you’ve never heard of. Three Tables is literally two minutes from Waimea Bay, and it’s an amazing place for snorkeling! You’ll see colorful schools of fish passing by, gnarled coral, and maybe even a turtle or two! Just be sure to never pass the three “tables” (the circular little “islands”), because, once you pass that point, the current can pull you without you even realizing it. By now, it’ll be getting pretty late. It’ll be time to find the perfect place to watch the sunset, so why not head to Sunset Beach? Now, be warned. If you do this day trip, you will be tired – actually, you will be completely wiped out. But it will be one of the most amazing day of your trip to Hawaii. After all, it is the ULTIMATE North Shore, Oahu day trip. 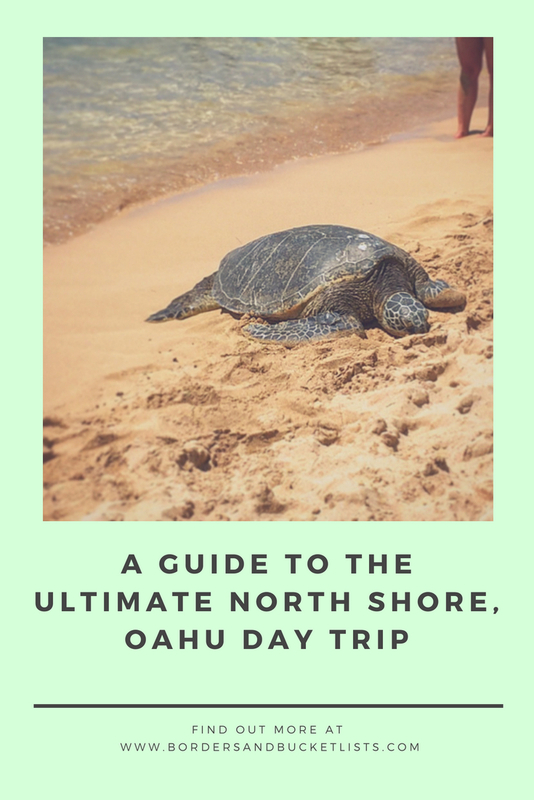 Is there anything else that you think needs to be added this guide to the ultimate North Shore, Oahu Day Trip? Write about it below in the comments! Did you enjoy this? Pin it! Now this lookslike a fun list. I love fruit so dole plantation would be a must. I would also love to go skydiving and try stand up paddle boarding. Such an adventurous list. Thank you! I kind of have an adventurous soul lol. I absolutely LOVE the North Shore! I swear it’s one of my favourite places in the world and I didn’t even do half of these things!! You have to come back and do the rest!! And I keep finding out more and more things to do on the North Shore (even as a local) so maybe I’ll make a second post about it later on :). Oh I would try that spicy shrimp in a heartbeat! I really hope to make it to Hawaii one day. Thanks for sharing! Lol good luck! I could never do Giovanni’s spicy shrimp. I went to the North Shore years ago so trying to remember all that I did! The one thing I remember is how huge the waves were. I definitely didn’t see turtles or do cliff jumping (I’m too chicken for that!). Yeah the waves on the North Shore are huge! It’s where they hold all of the surfing competitions, so it makes sense :). HAHA I would absolutely be the spicy shrimp girl who thinks she can handle it and then can’t…! Also love the drive-by cliff jumping adventure, would definitely be down for that. What a lucky lady you are to be from this magical place! Oh no! Don’t do the spicy shrimp, girl lol! And yeah, I’m so lucky to live here :). I would LOVE to do this. Looks amazing. Thank you! I hope you get to! Turtles, good food, beaches and cliff jumping? That sounds amazing. I might skip the skydiving though…not a huge fan of heights. Thanks so much, Carrie! I get it, skydiving isn’t for everyone. But I’m glad you liked the rest of the list! So glad this was helpful! And the cacao is such a good suggestion! The north shore is so great! So much to do and I loved the food trucks! This has given me lots of inspo for if I ever go back (here’s hoping!). So glad to hear that, Clazz! I hope you can make it back here one day! I wanna see a turtle!! :D They’re so cute:) I’ve never been to Hawaii, I’m so jealous that you grew up there!! Wanna go really badly…Thanks for introducing Oahu! Of course! I hope you are able to come visit one day! It really is such a unique and amazing place to visit :). Can definitely say “been there done that” but I think I would add a stop to get some shaved ice! Never tasted anything so good! Got a great pic of a turtle on the beach.But I preferred Waimea Falls to Waimea Beach. Wow so glad you got to do all of these things! I thought about adding shave ice, but none of my favorite shave ice places are actually on the North Shore. I was thinking about writing a blog post on those place in the future :). Next PostNext What Is the Best Hawaiian Island to Visit?